is a waterproof, flexible, protective coating used under ceramic coverings in showers and bathrooms. This one component, solvent-free synthetic resin is perfect solution to for light complex waterproofing in your wetroom. Recommended usage on substrates sensitive to moisture and the absorbent mineral surfaces. Dedicated for applying indoors - for e.g. bathroom or kitchen walls and floors. 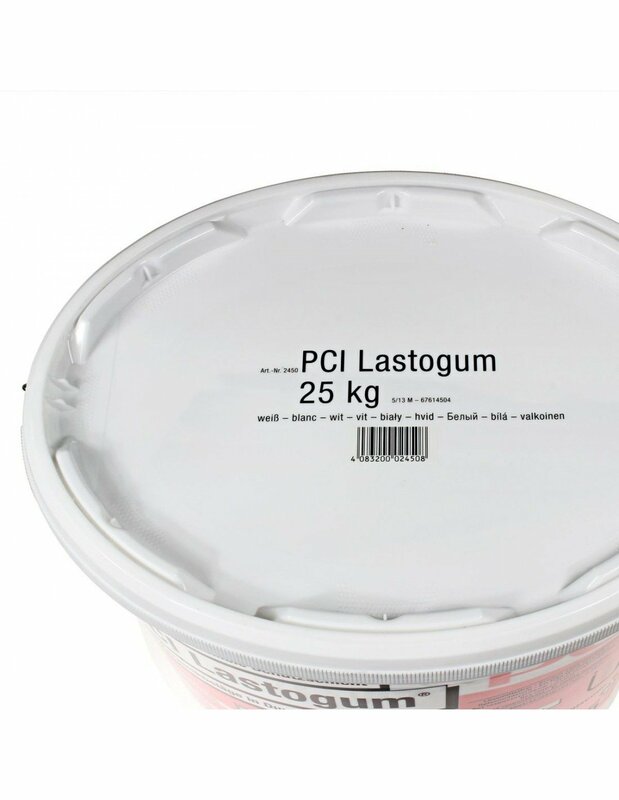 PCI Lastogum, compared to competitive products, characterized with very fast drying and incredible leak tightness. Second layer can be applied just after one hour, tilling possible after a further 2 hours. Product is avaiable in two colours: grey and white, for easier visual control of the layer thickness. Dry layer thickness is approx. 0.7mm, which works perfect in places where we want to avoid increasing the height. PCI Lastogum White should be used as a second coat of the tanking liquid for better cover control. 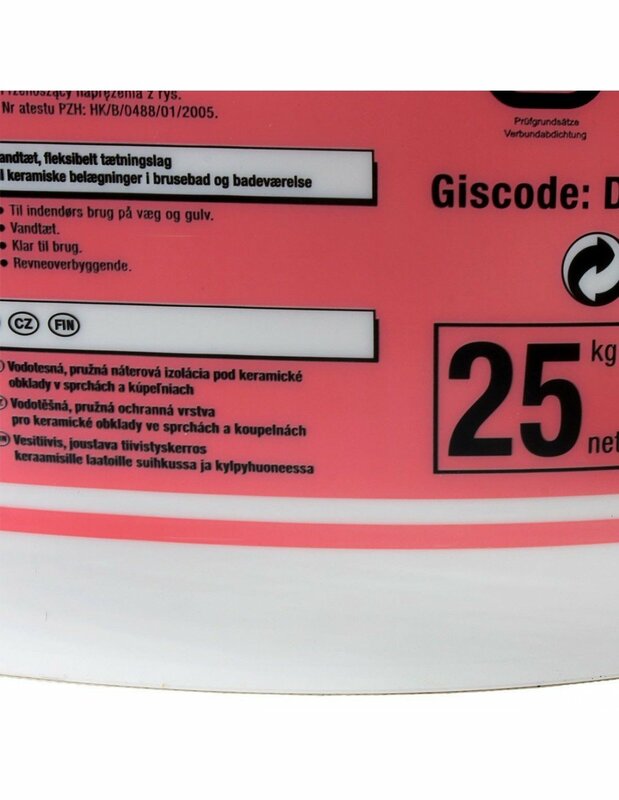 If you want to tank your entire bathroom area, 25kg pail should be enough to cover floor and walls on 21.5 m² surface (Consumption: approx. 1.1 to 1.2 kg/m²). Water impermeable, protects moisture-sensitive substrates. Flexible, compensates tensions, deformations of the substrate, variations in temperature and vibrations. Crack bridging, high reliability even if cracks in the substrate form at a later stage. Ready-to-use, easy to apply by roller, brush or trowel. Two-coloured, for easier visual control of the layer thickness. Resistant to lime water, ensures adhesion between protective coating and mortar if the adhesive bed is constantly submerged in water. Solvent free, no harmful risk to the environment, can be used without any risk to your health. Meets the test principles to issue an official test certificate for bonded waterproofing in combination with the adhesives PCI Carraflex, PCI Carraflott NT, PCI Carralight, PCI Carrament, PCI Flexmörtel, PCI Flexmörtel-Schnell, PCI FT Rapid, PCI FT Extra, PCI FT Flex, PCI Nanolight, PCI Nanoflott light, PCI Rapidflott, PCI Rapidlight, PCI Nanolight White. All test certificates are available under www.pci-augsburg.de. Liquid waterproofing membrane to be applied by roller, brush or trowel. For applications not covered under the official test certificates to ZDB leaflet „Bonded waterproofing”, for use class A 0. Use class A Wall in accordance with the test principles to issue an official test certificate. For use up to use class W4 to Austrian standard B 3407. For wet areas not exposed to pressurised water, such as bathrooms, showers in residential buildings, hotels, old people's homes and hospitals. On moisture-sensitive, absorbent substrates, e.g. plaster, gypsum blocks, gypsum fibre boards, plasterboards, particle boards, anhydrite screeds in moist and wet areas subject to usual domestic use. On mineral absorbent substrates, e.g. concrete, screed, render, aerated concrete, cementitious wall levellers such as PCI Polycret 5 and/or PCI Nanocret FC and self-levellers, e.g. PCI Periplan fein and PCI Periplan. Application of undiluted PCI Lastogum to the substrate by roller, brush or trowel. The substrate must be structurally sound, dry (cement screed 4%, anhydrite flowable screed 0.5%, measured with CM meter), clean and free from oil, grease and other residues which should be removed by sand-blasting, brushing or shotblasting (Blastrac) if necessary. The practically smooth surface must be free from honeycombs, gaping cracks or ridges. Prime gypsum-based substrates and plasterboards beforehand with undiluted PCI Gisogrund. Prime absorbent mineral substrates with PCI Gisogrund, diluted 1 : 1 with water. Prime dry, tightened particle boards with PCI Wadian. The primers must have cured before applying PCI Lastogum. 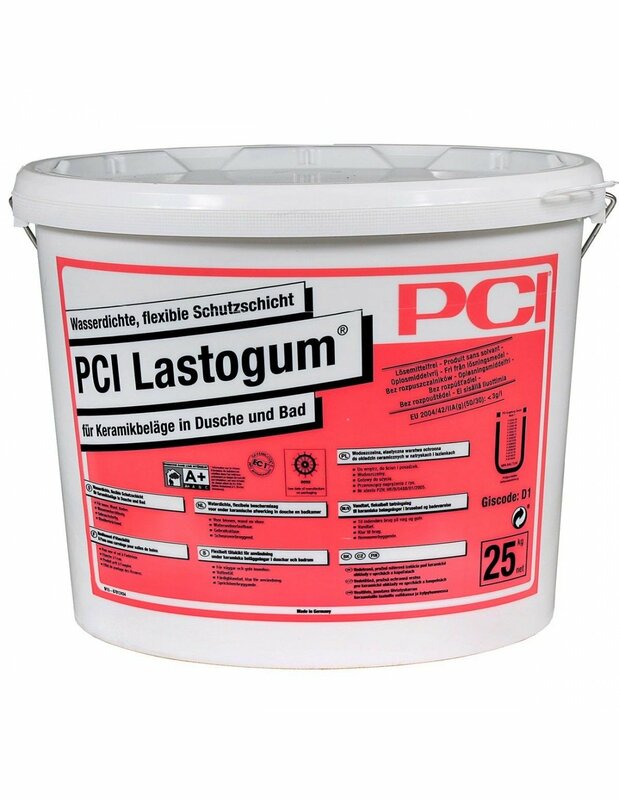 Apply undiluted PCI Lastogum by roller (lambskin roller), brush (wall brush, float), or trowel to the substrate covering the entire surface. A minimum of two layers is required. Place PCI Pecitape 10 x 10 and/or PCI Pecitape 42.5 x 42.5 over pipe culverts and floor drains, in corner joints and floor/wall junctions press PCI Pecitape 120 into the first layer of PCI Lastogum. Projecting edges of the fabric are covered by the second layer. Any further layer is applied when the first layer is dry. We recommend to apply the first layer with PCI Lastogum grey and the following layer(s) with PCI Lastogum white for better coverage control. The applied layer is too thin if the previous colour is visible; this should be avoided. 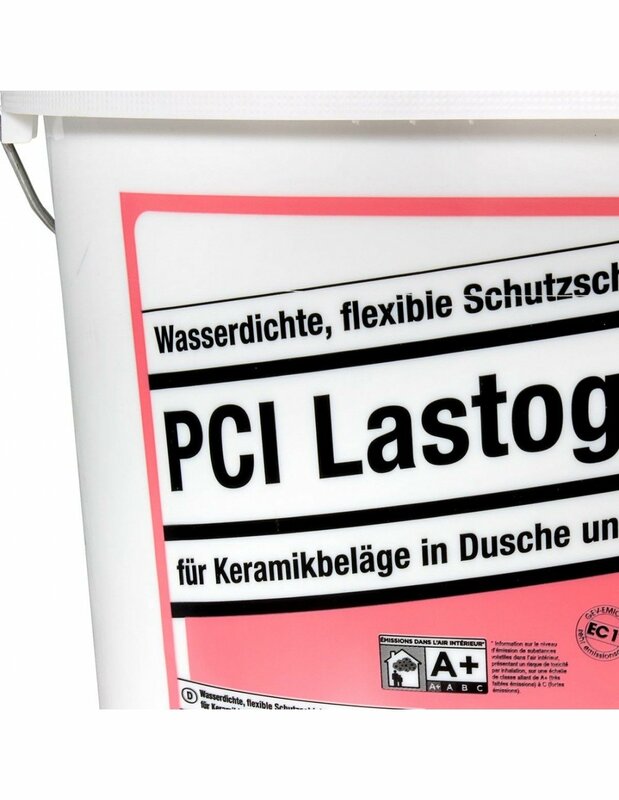 PCI Lastogum is not recommended for outdoor use and waterproofing measures in swimming pools. 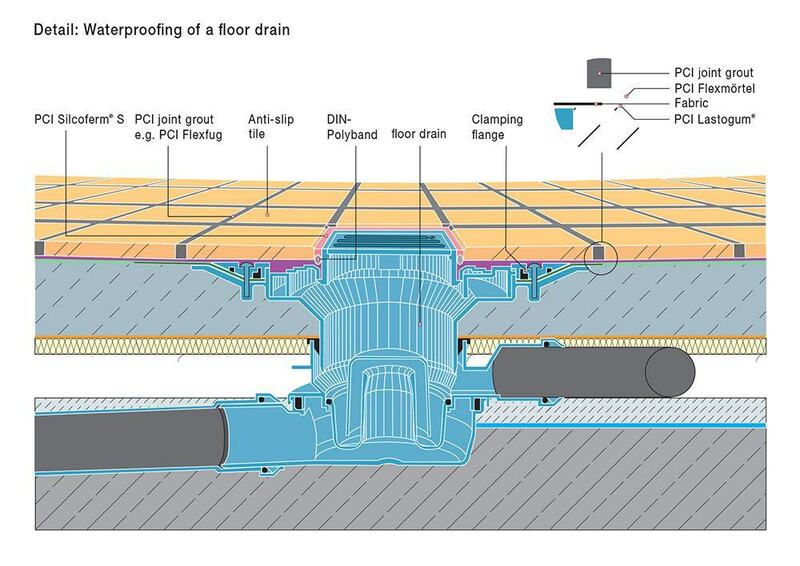 Use the crack-bridging waterproofing slurry PCI Seccoral for these purposes. Do not apply PCI Lastogum at substrate temperatures below +5 °C and above +25°C. The protective layer can be exposed to foot traffic after 2 hours at the earliest when applying two layers. 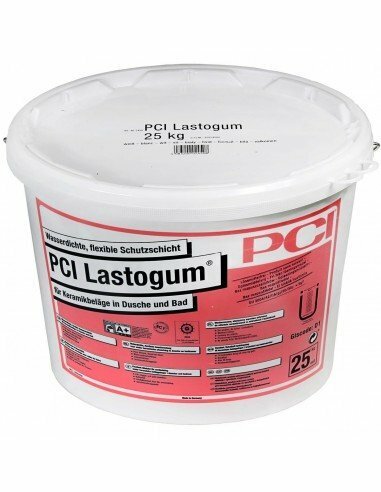 We recommend to apply the first layer of PCI Lastogum in grey and the second one in white for better coverage control. The first layer must not be visible. 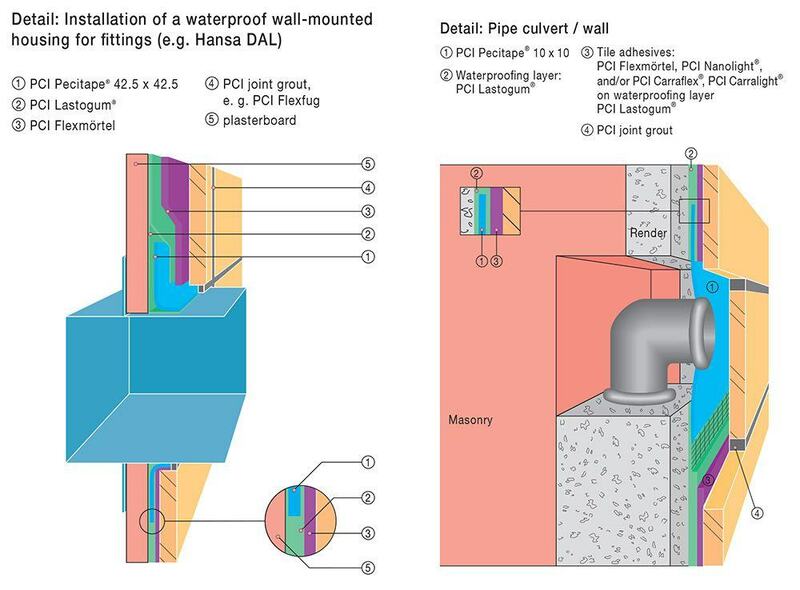 In-wall fittings which can be integrated into the water-impermeable protective layer of PCI Lastogum using PCI Pecitape 42.5 x 42.5 are available from e.g. Hansa or DAL, thin-bed floor drains are available e.g. from Wiper. The waterproofing collar PCI Pecitape 10 x 10 should enclose the pipe (not the plug which will be removed later), otherwise the pipe must be extended beyond the area to be waterproofed by inserting a spacer. The connection joint at the edge of floating screeds must be free from mortar and waterproofing slurry to avoid acoustical bridges. We recommend to leave an area free from PCI Lastogum, i.e. at least 10 mm in horizontal and vertical direction at the wall/floor connection (see detailed drawing). Possible contamination on the barrier strip should be thoroughly removed before inserting the waterproofing tape. Tools should be washed with water immediately after use. When the product has cured it can only be removed by mechanical scraping. Shelf life: min. 12 months; dry and protected from frost, no permanent storage over +30 °C. The waterproofing layer must also be applied below and behind the shower base and bathtub if the surrounding area is sensitive to moisture. Chat started. Session ID: 1556251386. You are now connected to: David M.